The console crowd is still a few months out from getting to try out Playerunknown's Battlegrounds, but an intriguing - and free - alternative is just a week away. Epic Games announced today that Fortnite Battle Royale, a new mode that proudly cribs notes from PUBG for its early-access builder/shooter game, will be free-to-play when it arrives on September 26 across PC, PS4, and Xbox One. Just like PUBG, Fortnite Battle Royale sets up to 100 players against each other on a massive map with no respawns and one objective: be the last one standing. 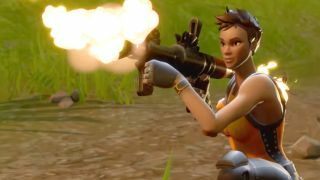 Unlike PUBG, you don't only have your wits and your gun skills: players will also be able to harvest resources and build structures just like they can in Fortnite's campaign mode. Minecraft players have been skirmishing on their own unofficial Hunger Games servers for years so there's some clear precedent for building and battling here. Fortnite Battle Royale will be playable solo or in squads as soon as it comes out. Epic's official FAQ says it's considering adding vehicles to the game (they're a pretty important part of PUBG) but it hasn't decided on anything yet. Building a huge tower and sniping everybody from on top of it seems like plenty of fun until then. No need to rush if you can't play as soon as Fortnite Battle Royale goes live for the public on September 26: Epic says it'll remain free-to-play, though you may be able to purchase some cosmetic items in the future. Fortnite's PvE campaign mode will still require a separate purchase to play, at least until it's fully released. Yes, a game that has a trend-chasing multiplayer mode update isn't even technically fully out yet. Video games are weird but also good sometimes.